And the smoke billows from the ruins. Many thoughts at once run through his mind and collide. He stands alone, afraid to look. In his arms, he holds all that is left of his life. The life sniffs the air and hides his eyes under his paws. He knows what has happened as he howls at the blood red, war torn sky. 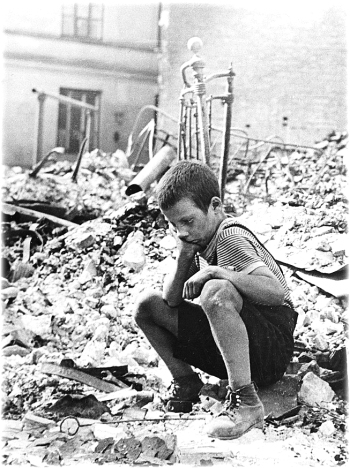 This entry was posted in Being, Poetry and tagged child, innocence, life, ruins, smoke, war. Bookmark the permalink. brave and beautiful post . Thank you very much for your kind words. I have heard of the Cranberries, but not that song. Very fitting to the words. Thank you. http://www.youtube.com/watch?v=bejlRMzFZoQ brave and beautiful post .